A: As I often tell my Buddhist friends, if we want to keep the excellent tradition of Buddhism developed in Tibet alive, it will depend on the existence of freedom in Tibet. To that end, since you are already working together, I would like you to continue to work for the cause of Tibet’s freedom with those who are already doing so. We try to make a distinction between the words “freedom” and “independence.” The use of the word independence is somewhat delicate. Obviously, I have been trying to establish contacts with the Chinese government and begin serious negotiations. For fourteen years I have been trying my best, persisting in this approach, and pursuing my efforts incessantly to bring these negotiations to a successful conclusion through direct talks with the Chinese government. I would like to share some of my thoughts with all of you gathered here, brothers and sisters in Buddhism. First of all, Buddhism corresponds to a new tradition, a religion which did not previously exist in the West. Consequently, it is normal that all those who are interested in Buddhism in its Tibetan form would also like to be informed about and continue to study other religions and traditions. This is perfectly natural. However, for those who are seriously thinking of converting to Buddhism, that is, of changing your religion, it is very important to take every precaution. This must not be done lightly. Indeed, if one converts without having thought about it in a mature way, this often creates difficulties and leads to great inner confusion. I would therefore advise all who would like to convert to Buddhism to think carefully before doing so. Second, when an individual is convinced that Buddhist teachings are better adapted to his or her disposition, that they are more effective, it is quite right that this religion be chosen. However, human nature being what it is, after their conversion and in order to justify it, such a person may have a tendency to want to criticize his or her original religion. This must be avoided at all costs. Even if the previous religion does not seem as effective as he or she would have liked (and this is the reason for the change), this is not sufficient reason to claim that the old religion is ineffective for the human spirit. That religion continues to bring immense good to millions of people. For this reason, as Buddhists, we must respect the rights of others, for other religions help millions of people. In particular, we are in the process of trying to create and maintain a perfect harmony among all religions. In these circumstances it is absolutely essential to be aware of the need to respect other religions. Third, in the Tibetan Buddhist tradition emphasis is always placed on the combination of study and practice. Of course, it may happen that you devote yourself more or less to study. Some people may pursue their studies very far, others may be satisfied with a more limited level of study. Whatever the case, at the foundation you must never separate study, reflection, and meditation. You must also preserve the tradition of practice in which study, reflection, and meditation are indivisible. Fourth, I would like to insist upon the importance of non-sectarianism. It sometimes happens that people attribute an exaggerated importance to one or another of the different schools and different traditions within Buddhism, and this can lead to an accumulation of extremely negative acts with regard to the Dharma. The advantage of non-sectarianism is that after receiving the transmission of the instructions, initiations, and explanations pertinent to each different tradition, we will be able to have a better understanding of the different teachings. From my own experience, this is without doubt very beneficial. Consequently, if we keep a non-sectarian attitude, as we receive teachings from different traditions, think about them, and put them in practice, it is certain we will improve our understanding of the Dharma. This is why non-sectarianism is so important. Traditionally in Tibet there have been two approaches used by the many great scholars and accomplished masters. Indeed, while some concentrated on the study and practice of their own tradition, their own spiritual heritage, others expanded the field of their study and their practice of Buddhism from a non-sectarian point of view. This tradition already existed in Tibet among the great masters, and I think that today this non-sectarianism is extremely important and is the best Tibetan custom to follow. There is a fifth point I would like to go into. For just under thirty years, Tibetan Buddhism has been spreading through the different continents of our earth. Lamas, tulkus, and Geshes have made an enormous contribution to the flowering of Tibetan Buddhism all over the world, aided by hundreds of thousands of students and disciples. During the same period, some rather unhealthy situations have arisen, and this has led to difficulties. Initially this was due to an excess of blind faith on the part of the disciples and also to certain teachers who eventually took advantage of their disciples’ weaknesses. There have been scandals, financial and sexual abuses. Such things happen! As a result I must insist at this point that it is absolute necessary that both disciples and teachers keep the goal in mind—to preserve a perfectly pure Dharma. It is the responsibility of us all to put an end to this type of unhealthy activity. The Buddha taught the four ways to bring together the disciples, and this was to ensure the welfare of others. The six perfections (Sanskrit: paramita) are practised to achieve one’s own good, and the four ways of bringing together the disciples to achieve the good of others. This involves, first of all, giving material gifts, then practising right speech, then providing help, and finally harmonizing one’s words and acts. Above all, it is important to keep this last point in mind. If we do not master our own mind, it is impossible to master the minds of others. We do not know whether or not it is possible to master the mind of another, but it is what we are supposed to do! Whatever the case, it is essential for those who claim they wish to help others that they control their own minds. To do this it is very important nowadays for teachers to be reminded again and again of the teachings of Buddha on how to help others and harmonize words and acts. As far as the disciple is concerned, to quote a Tibetan proverb: A disciple must not throw himself upon a spiritual master “as a dog throws itself upon a piece of meat.” A disciple must not rush to place their trust immediately in a master, but must rather take the time to reflect carefully and examine the master’s qualities before establishing a spiritual bond with them by receiving their teachings. It is preferable to receive the teachings of a master while viewing him or her first and foremost as a spiritual friend. We must not rush to hear their teachings and consider them our master at the same time. Little by little, if having observed them we are convinced that they are a true master, fully qualified and worthy of trust, we can follow their teachings by considering them our master. We must not hurry. The sixth point which I would like to go into regarding Dharma centres concerns our oft-invoked prayer: “May all beings find happiness and its causes.” This is something we should apply directly by doing something useful for society. Engaging in social activity in the community, by trying to help those who are in difficulty, such as those with mental or other problems, for example. This does not necessarily mean we should teach them the Dharma, but rather use the teachings ourselves in order to help them. I think such activity directed toward others is something we should develop. It is the natural conclusion of another common prayer: “May all beings attain happiness and be free from suffering.” On this principle, if we can bring good, even if only to one person, we are fulfilling in part the vow we have made. Moreover, the entire Buddhist community of these centres should participate in social engagement by assisting others, and I think this is something very important with regard to the operation of these centres. A vegetarian diet is not obligatory for Buddhists. Still, for those of us who follow the teachings of the Great Vehicle, it is important. But the teachings of the Buddha were open and flexible on this subject, and each practitioner has the choice to be vegetarian or not. Large gatherings are sometimes held in Dharma centres and when there are such festivities, celebrations, or teachings, I think that if a great number of people are to be fed it is very important to serve only vegetarian food for the entire duration of the meeting. Seventh point: we often say this prayer, “May the teachings of the Buddha (the Dharma) be propagated.” If Tibet regains its freedom, this will certainly help to preserve the vast and profound teachings of Buddha, including the Lesser and Great Vehicles as well as all the Tantras. There is therefore an obvious connection between the freedom of Tibet and the preservation of the teachings of Buddha in the world. If this were not the case, if the fundamental question of Tibet’s freedom were solely a political issue, then as a monk and a disciple of the Buddha’s tradition I would have no reason for such concern. But the two aspects are closely linked. Even when I am advocating the demilitarization of Tibet, that it be made into a peace zone, although the term “demilitarization” is not strictly speaking a term from the Dharma, the project is nevertheless closely related to the Dharma. Many of you, representatives and members of the different centres, are among those who have already contributed to the cause of Tibet’s freedom. I thank you for that and ask you to continue your efforts, bearing in mind the relation between the preservation of the teachings and the freedom of Tibet, in order to give practical expression to the vow that the Buddha’s teachings be preserved and developed. My last point—you must keep your mind happy and know how to laugh! Found at www.hhdl.dharmakara.net // Original source: Extended Quote from “Beyond Dogma – the challenge of the modern world” by HH Dalai Lama, pages 139-143. English translation published by Souvenir Press, UK, 1997. Originally published in French as ‘Au-dela des Dogmes’ by Éditions Albin Michel S.A., Paris. This is an extended quote from ‘Beyond Dogma – the challenge of the modern world’ by HH Dalai Lama, pages 139-143. English translation published by Souvenir Press, UK, 1997. Originally published in French as ‘Au-dela des Dogmes’ by Éditions Albin Michel S.A., Paris. All the teachings in the book were given during HHDL’s visit to France October 24 to November 16, 1993. The teachings are organised thematically, not chronologically, so it is not possible to identify exactly where and when each teaching was given. Thank you! Will add the source later the day. Tibetan Buddhism is not “pure” Buddhism ,if that entity exists, it has been heavily influenced by Bon. Everywhere Buddhism has gone it has adapted to the culture e.g. Zen etc. I think the concept of “pure” itself is very questionable. Basically in Buddhism we speak about Dharma and either something is dharma or non dharma. However, there is no pure dharma nor impure dharma. Lol! Oh Tenzin, there IS impure dharma! It’s false dharma! Remember the vow a against preaching it. OK, you could argue this is related to the ultimate reality. OK; another argument to support my point, the old Kadampas seem not to have discriminated between pure and impure dharma but between dharma and non dharma (if you find any passage where past great masters or Buddhist scriptures have discriminated between pure and impure dharma, please show it). “What is the difference between Dharma and non-Dharma?” the teacher Drom[tönpa] was asked by Potowa. Another thought, Alex Berzin mentioned that “pure” means different things in different contexts. So maybe we have to start from a definition of “pure dharma”. According to this explanation, the speech of GKG is impure because of having given unclear and mistaken explanations on faith and sectarianism. “handed down in an unbroken lineage from Buddha Shakyamuni” – Buddha didn’t teach Shugden at all. So handing down Shugden must be per definition impure dharma… Though the NKT/GKG would strongly object and say those who object Shugden worship are those who destroy “the pure dharma”. The issue here is trying to keep the dharma free from pollution for future generations. Sometimes people take Dharma and twist it slightly to suit their cult/ personal needs. As a linguistic device, I think it ok to use the term impure dharma to denote this. We are not writing dharma texts. Let’s stick to the real purpose of this site rather than bury important materials in mountains of posts about subtle linguistic distinctions. Buddhism originated in India as a way to escape atrocious oppression, better be a begging monk than toil and suffer, for both men and women, what a life to meditate, recite mantras and seek nirvana, only desperate people could want that. In the West it appealed and appeals to middle and upper class people looking for exoticism and feel ‘special’… You don’t find buddhists among the very poor, who must have common sense to survive, it only appeals to people witn ample means. How anybody beleive that the Buddha survived for years with only a grain of rice a day and drinking his own pee? Or that he could levitate at will? I’m not Buddha but I’ll give you a piece of real wisdom: Human gullibility is a great curse. J.J. you seem to be unaware of the work of Dr. B.R. Ambekhar. Why did the Republic of India adopt the Buddhist wheel as its national symbol? It is because many millions of “low caste” or “untouchable” dalits find self respect and a better life of emancipation found under this umbrella. I watched the film The Buddha (2010) in which a fervent apology of buddhism is made using a series of arguments that should apparently make us take it all very seriously. As I watched it, my wife in another room could hear me engaging in a series of expletives-deleted and mirth at the things that were being said. I tried to explain to her why I reacted that way to the beautiful images and honeyed words by devout believers talking in the film. People often try to find enlightenment in very strange ways. There has been a certain malaise among affluent people in the West for a very long time. Instead of seeking answers to their problems within themselves, deciding what to do with their lives using reasonable options open to them that would make them happy people, many resort to eccentric means that are not really necessary and distract them from the true solutions to their problems. Buddhism originated in India from one of the many ascetics there as a way to escape atrocious oppression for both men and women, better be a begging monk than toil and suffer and risk being killed in warfare, what a life, to meditate, recite mantras and seek nirvana, only desperate people could want that instead of a full life. In the West it appealed and appeals to middle and upper class people looking for exoticism and feeling ‘special’. Western philosophy can provide enough answers so that whoever isn’t a snob can dwell on it instead of searching for wisdom in the far east, where a variety of scoundrels take advantage of naive westerners with deep pockets (remember the Beatles and Maharishi Yogui being driven around in a Rolls Royce and controlling a huge fortune thanks to their and other famous people’s endorsement) as well as numerous fashionable ‘gurus’ that charge hefty fees for their lectures and books. You don’t find many buddhists among the very poor, who must have common sense to survive, it only appeals to people with ample means and deep angst problems, not to those too busy to earn a living to pay attention or to those with a certain amount of critical thinking. Reincarnation and the search for ways to avoid it, ending such a cycle, as well as the end of human suffering are significant aspects of buddhist teachings. Although it might please some to feel they are the reincarnation of famous people (very few ‘remember’ having been slaves or simple peasants), it’s just an unsubstantiated belief, no more, and Buddha himself thought that even animals like insects were part of this scheme. It’s hard to imagine how an ant could meditate itself out of it, but there are no limits to some people’s imagination. And suffering is part of life, as are happiness, the feeling of accomplishments through hard work and inspiration, the satisfaction of having a family, of contributing to society in a variety of ways, being people fully aware that there can be no end for human suffering, being an unavoidable reality of life. Discouraging action that can fill our lives with valid accomplishments and banish feelings of unease and frustration and replace them with isolation from the world to meditate out of our problems by reciting mantras, sounds more like a drug that numbs many away of what makes us human. How can anybody take seriously the platitudes and pseudo-deep inferences of Gautama as profound wisdom? How can anybody believe that the Buddha survived for years with only a grain of rice a day and drinking his own pee? Or that he could levitate at will? I’m not Buddha but I’ll give my readers a piece of perhaps real wisdom: Human gullibility is a great curse that afflicts mankind and leads to much of what is reprehensible in the world. Well, Gotama – the Buddha to be – himself is a “perfect example” for this thesis I guess – having escaped his principality where he suffered from oppression? I can’t see that. For instance, our own Buddhist center attracts rather the poor. And its also not true that those interested from middle and upper class look only “for exoticism and feeling ‘special’”. I think such generalisations don’t meet reality. Well, you seem to know whats good and right and that we don’t need anything from “the far east” – our societies have created a lot of enlightened beings I guess, the wisdom of how to cultivate the concentrations / jhanas, how to perceive directly subtle impermanence, no self and dukkha is so much developed in the west that our Western philosophers were marked by mental tranquility, deep states of peace of mind and guided a lot of people to these states which can be attained through the trainings in ethics, concentration and wisdom. I agree, what can we find about that among Western philosophers? Is there anybody who denies this? Of course animals and insects are part of this scheme. And of course, the idea to be “special” is rather a sign of the activities of “mara” (see Patrul Rinpoche about the “Blessings of the Demons”) And of course – as with any thing – the extraordinary or the real good is rare. Reading your rand, it seems you seem to have no clue about Buddhism but a lot of lack of knowledge of its inner logic and thinking. Its not part of Buddhism and its path in any way to “banish feelings of unease and frustration and replace them with isolation from the world to meditate out of our problems by reciting mantras”. I guess you have no experienced of the path otherwise you would not argue that, the Buddha taught “platitudes and pseudo-deep inferences” “as profound wisdom” With respect eating one piece of grain “for years”. According to what I know he ate for A WHILE only one piece of grain a day, secondly, nobody has to take this literally because it basically says he ate very little. And according to himself, he became extremely thin. There is no reason to doubt that. I am not sure if he drank his own pee. What matters for me is that he tried an extreme of asceticism and realised it doesn’t work. I’m not Buddha but I’ll give you a piece of perhaps real wisdom: Human ignorance is a great curse that afflicts mankind and leads to much of what is reprehensible in the world. However, everybody is free to see and experience for himself and nobody has to follow anything. I think we can leave it with this. You had your say. Nice to see you havent lost your sense of openness and tolerance JJ. Keyboard warriors of the world unite against………everything! It’s weird to see that any criticism is seen by some as a sign of intolerance. It seems they would love to have their beliefs unchallenged by threatening those who criticize with being called ‘intolerant’. It’s a trick that doesn’t hold water. For that matter, how can anyone believe that Donald J. Trump is the American president? He does not believe in western science either! Thank you. As a matter of fact, all my life and worldview comes out of science, I’m a scientist and I’ve built over science like over a solid rock, not over wild speculations and meditations. Funny you mention Trump, I think he is trying to accomplish things a large part of the US people want and unlike politicians, he’s keeping his promises. As to environmental science, there are besides those interested in keeping substantial grants and other benefits, others that don’t accept the doomsday predictions of many and have quite different approaches to the subject. Regarding science education, The Dalai Lama has been collaborating with Emory University in Atlanta (and others) for several years. Thousands of pages of basic science including optics, nuclear physics, thermodynamics, astronomy and so forth have been translated into Tibetan language and are a foundational part of the curriculum in all the major monasteries as well as secular schools in India. Meanwhile, one wonders how many of Trump’s climate change denier cabinet harbour the primitive Abrahamic creationist view that the planet is 6,000 years old? time in any direction, it’s a natural phenomenon, like the warm age in Medieval England where vineyards thrived and the little Ice Age in the 18th century when people skated on the Thames in winter. Trump backs these scientists and that is science, not fundamentalist beliefs. I think you are not very realistic with such a claim as “Trump backs these scientists and that is science, not fundamentalist beliefs.” The EPE web site has removed in their mission statement that their work is “science-based” – meaning they were based on what peer-reviewed science recommended as safe levels of pollutants for drinking, swimming, or fishing. Trump backs no science or anti science politics. However, no matter what your beliefs are this is not a blog to discuss US politics. Exactly. But I wasn’t the one who brought up Trump. Being one of his supporters, I couldn’t let remarks that ridicule him pass without a reply. And I have already said what I think of buddhism, especially in the West. With my best wishes that you don’t reincarnate anymore, it is goodbye then. and all the best for you too! May all your spiritual wishes be fulfilled. I was reading comments , and I wish that all the arguments end just like this one. With good wishes and great spirit. Good wishes to you all! I’m 72 years old, perhaps just about to reincarnate into a snail or puppy dog tail 🙂 because of my negative opinion of buddhism, mainly for westerners, but in my time years ago this was just natural, it’s only now with facebook and other forms of mental imbalance that bad reactions occur. For a long time I struggled to come up with a good definition of facebook until at last I got it: narcissistic compulsion of verbal diarrhea. It is almost a given these days that the Dalai Lama has the highest authority in matters of morality and ethics, and of course he is widely known as a man of peace who always promotes non-violence. His influence in the Buddhist world is even greater and in Tibetan Vajrayana Buddhism it is enormous. Indeed he is regularly referred to as “spiritual leader of Tibetan Buddhists.” In some countries, like India for example, ordinary people often know nothing about Buddhism aside from its association with the Dalai Lama. Unless westerners and blind Tibetan devotees inform themselves of past and present realities, they will uncritically continue to swallow every remark the Dalai Lama makes as if it is the gospel truth. And unless they ask the basic questions raised here while the Dalai Lama is still alive, serious dangers await both the Tibetan community and the future of Buddhism itself after the Dalai Lama passes. A bit tiresome what you wrote. I just glanced through it. It seems to be the common package Shugdenpas sell or misinformed NKT people spread – though your comment is less aggressive in tone. On HuffPost and Reuters there were also some attempts to revive the Shugden conflict and (misinformed) arguments commonly thrown into the discussion. 1) well, the 12 year old, isolated, child, who had nothing really to say could have intervened? 5) “Nor does the Dalai Lama admit that all four of his gurus were students of Phabongkhapa” – what a nonsensical claim. If been asked, he would not deny it either but openly admit it. Just do your maths. 6) It cannot be denied that Shugdenpas were / are shunned but its not as bad as you want to tell us. Basically, killings and attempt to kill were done by Shugdenpas. 7) Tibetans don’t laugh at Westerners but rather stupid propaganda from Shugdenpas or China 😉 Ling Rinpoche – the SENIOR tutor of the Dalai Lama (Trijang Rinpoche was only JUNIOR – junior in rank! – to HHDL) had a totally different stance on Shugden and also pointed out the potential conflicts for the Dalai Lama in relying on him. 9) Puuh And then this Karmapa issue. I read both sides’ arguments. To cut it down. While Nydahl / Shamarpa / Diamondway / NKT followers etc. speak of the “Chinese Karmapa” they totally deny the fact that the majority of the highest Kagyue Lamas accept Trinley Dorje as the right candidate and that this Karmapa candidate is supported by the majority of Tibetans and high Kagyue Lamas alike. Hence, the myth of a Chinese Karmapa is only propaganda. Personally, I don’t know who is right or wrong candidate and I don’t mind either but for sure, you just continue to spin common Shugdenpa or Anti-Dalai Lama propaganda. Hearty wishes, sorry for not taking you too seriously. I guess you mean it as you say it… but this doesn’t mean it is true or makes sense. Ah, and there was also Bachmann, Michael Backmann, when I remember correctly mentioned in your comment when I glanced through it this morning. This post is designed to create confusion, like the posts of many Shugden supporters who post under false Tibetan names to lend their conspiracy theories credence. First, decry Phabongkha as sectarian to try to discredit the lineage of the DL’s teachers. Portray him as an oppressor of the other traditions. Then,give a one-sided presentation of the Shugden situation portraying the Shugden faction only as victims, and not looking at any of the events that led up to the present situation (Yellow Book, Lobsang Gyatso, etc.) Events that had nothing to do with the Dalai Lama. Frame Trijang Yangsi Rinpoche as a victim separated from his disciples, after decrying his lineage head as an oppressor. It is the same sort of confusion inducing drivel one finds written in poor English on ds.com. Virulently denying connections of DS lamas with China, while at the same time publishing laudatory articles about how the PRC government is giving millions of dollars to refurbish Shugden monasteries and organize tours of DS lamas in the West. The Khenpo Jigme Phuntsok yangsi was first found by the lamas of Larung Gar, and only then “recognized” as a formality by the Dalai Lama. The DL did not unilaterally seek out the incarnation, a pertinent point not mentioned in the comment. As for science undermining Buddhism, this sounds to me much like the crazy Christian fundamentalists who want to ban teaching evolution in schools in the American south. Science is here. Engaging with science will only help Buddhism, by maintaining it as a logical and relevant spirituality. Those Buddhists who decry Science will go the way of the dodo bird. The call to analyze is comical. We’ve seen what happens to anyone on the web who dares to analyze the edicts and less than honest pleas of Shugden lamas on the web. They are harassed, harangued and mocked. The Reuters piece was a paid-for advertising feature. It wasn’t written by Reuters. Tenpel, this Jamyang Tsering sounds likes the same guy who was just tossed off the What Now blog. Desperate for an audience? Uuh. In a way if you believe that you will think the world got it wrong. You might genuinely work to lift “the delusion” the world has with the Dalai Lama. Mhm. May he awake. “He is surely not exempt.” Well, what about you Tshering? Non-citations of those un-named close associates supposedly ‘in the know’ do not fly as journalism since they cannot be fact-checked. You essay would not make it in academia, either: no proof, no references. 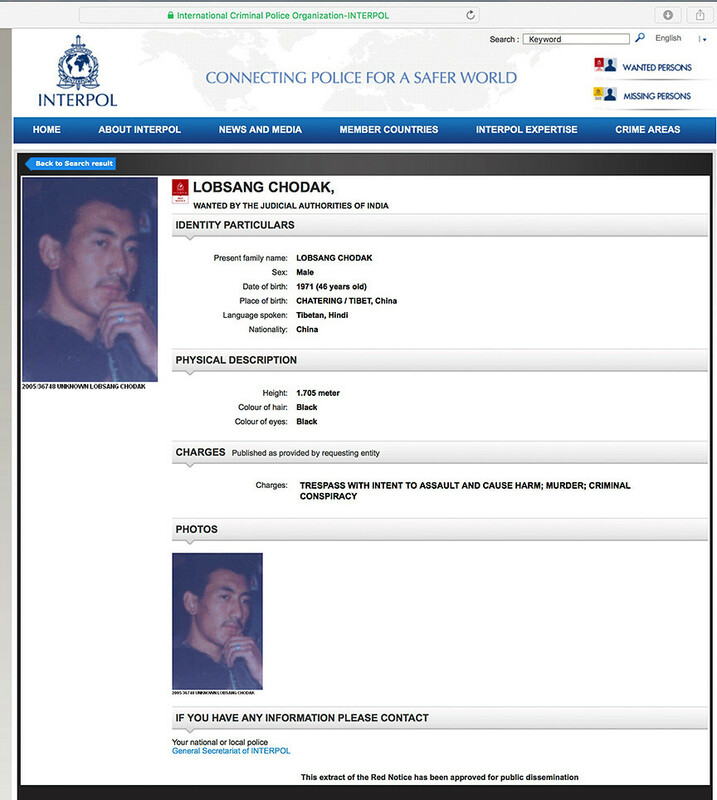 However, since you claim to be in the inner circle, do tell us when INTERPOL–now under the leadership of a Chinese, Mr. Meng Hongwei–going to extradite the cultists wanted for the triple murder in Dharamsala from China to India for trial? Justice would go a long way towards clearing the air.